On Sunday, Feb. 21, Rev. Allan Belton blessed the latest products from our group of busy knitters, crocheters, and quilters. Many personal items were delivered to Knitting for Those in Need in Kent. There were 51 scarves, 14 caps, 2 pairs of mittens, and 2 beautiful afghans. In addition, 5 quilted sleeping mats will be sent to a camp for AIDS orphans in Swaziland. The Christ Church Peace Pod members knit, crochet, and weave as an outward and visible sign of our real work: knitting together the global Beloved Community. Our Peace Pods present projects including Peace Pals for refuge children (global conflict areas) and scarves for children visited by Dentists without Borders (Nepal, Native Americans, etc). We knit/crochet at home, and together two or three times a year for a series of evenings. We also appear in public (Hudson Farmer’s Market’s community day) to reach out to interested persons in the wider Hudson area. 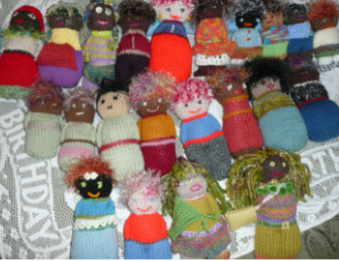 Peace Pods are groups of knitters and crocheters who actively support the work and mission of the organization Women4Women-knitting4peace. Since their founding in 2006, Women4Women, organized out of the Chautauqua Institute in NY, has created over 40,111 items and completed 373 personal deliveries in 52 countries. When a pile of goods has been collected (a drop off location is in the parish hall) we formally bless our pals and scarves at the church service before sending them out into the world. We offer patterns, instructions and lessons. Our bundle of Peace Pals paused for a picture just before they were loaded into a box headed for Woman 4 Woman Knitting 4 Peace (www.knitting4peace.org.) last spring. We knit on Tuesday evenings once a month, meeting in one another's homes. Please join us! We offer patterns, instructions and lessons. Children's’ scarves 4" X 54" must have three or more bright colors. We hold monthly meetings, usually on Wed. nights at 7:00. All are welcome, including those who would like to learn. Click name to email Eileen Gaston for more information.